Two sites I frequent and get lots of beautiful freebies from are doing a "Journals of Love Challenge" for cancer patients this week. I decided to participate in this R.A.K. (Random Acts of Kindness), in part to show my appreciation to Cora for maintaining these sites and giving us so many nice things to work with --- for FREE! Thanks Cora!! I chose images from Clearly Vintage to make my journals. Here's the feminine one I made using a little girl from an Oct. 2008 post. After printing the image on light brown cardstock, I tore and inked the edges for a vintage look. 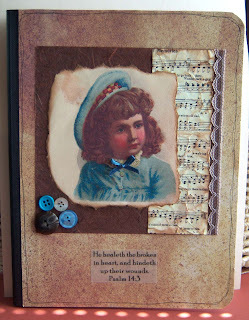 Add a piece of music (crumpled/sanded/inked - for vintage look), a blue ribbon at her neck, brown square of paper, buttons, and a strip of old lace for the completed look. Did the messy hand-drawn border all around the edges of the journal. 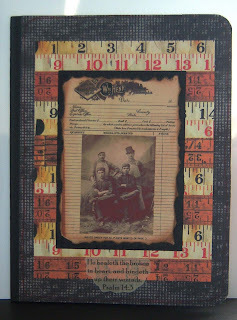 For this journal I layered two images from February 2009 posts on Cearly Vintage. I also tore/inked the edges of this photo for a vintage appeal. Added black matting, and layered it on the vintage yard stick paper. The background paper is a black mesh pattern. Both journals have a plain back to them with the messy hand-drawn border around the edges. These are gorgeous! I have such a hard time maintaining a vintage look when I try it, but you have it perfected. I'm sure anyone would appreciate one of these! beautiful work! How nice you you to make the journal!